– using your head | brainsnorts inc.
As I have said many times before, when I see evidence that shows I’m the smartest person in the room, I’m probably in the wrong room. “Despite new technology in helmets developed over the past two years, concussions are still at the forefront of the NFL. Concussions were up 21 percent in 2010 over the season previously. Over eight weeks, 154 such injuries were reported versus just 127 in 2009. Based upon a survey of former NFL players in 1996, as many as 61 percent of NFL players suffered from some kind of concussion.” – William Browning, Yahoo! Sports, Sept. 23. Why doesn’t anyone else involved in this issue get it? Why don’t they understand what actually causes concussions and why no helmet is going to stop a concussion? To paraphrase Hawkeye Pierce from M*A*S*H, a concussion occurs when your brain sloshes over to one side of your skull. Imagine this: you’re carrying a bucket of water while running. You stop suddenly. What happens to the water? It sloshes around the bucket and will probably spill over the edge in the direction you were running. The bucket is your skull, and the water is your brain. Your brain doesn’t exactly spill out of your skull, but it does move. There’s a fluid that surrounds your brain, kind of like a cushion, but if you’re moving fast enough – and stop suddenly enough – your brain pushes through that cushion, bashes against your skull, and actually gets bruised and swells, just like your arm or knee would. And just like your arm or knee, it gets injured. To transfer this to the football field, you have players running at top speed. Inside the helmet is a skull, and inside the skull is a brain, albeit feeble. When those players collide, often helmet to helmet, their skulls immediately stop and reverse direction, but not their brain. That squishy thing is still going forward and scrunching up into the front of the skull as the head is now going backwards. Better helmets will not stop this, unless you make a helmet that crushes upon impact so that the skull is not propelled backwards. Actually, that would be fun. Helmets would be made of sugar, like the whiskey bottles that cowboys smash over each other’s heads in Western movies. The key cause to the concussion – which the NFL does not seem to understand – is the moving and stopping. That’s why the helmets are not going to change anything. The reason there are more concussions, and there will always be more concussions, is because NFL players are bigger and stronger and faster. They are moving faster towards each other, and when they collide, and thus stop moving – or even move in the opposite direction – their brains, which had been moving very fast, are going to slosh with even greater force against their skulls, and thus suffer even greater concussions. Unless these improved helmets are going to somehow slow the players down as they near each other, it is useless to pursue better helmet technology. In fact, I agree with Hall of Fame coaches Mike Ditka and Joe Paterno. If you really want to stop concussions, take the facemasks off the helmets. That’ll slow them down a whole lot. 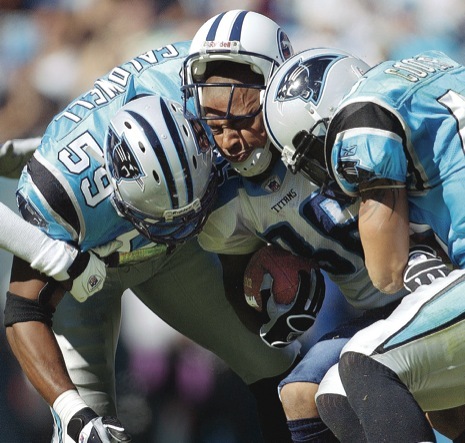 If you watch a typical football game, you will see that most defensive players have no idea how to tackle. Players have this brilliant idea that they are so big and strong that they can launch themselves into the ball carrier, and their own power is going to knock the player down. I can’t tell you how much I love watching a defender lower his head, take his eyes off the ball carrier, lean towards him, and end up on his face five yards away as the ball carrier gains another ten yards. There’s a false sense of security in the equipment. Players feel as if they’re in a protective bubble, and their bubble is tougher than your bubble. It’s wrong, but whose fault is this? I suggest that it’s the coaches who are at fault. If NFL players, after all these years, are still not tackling properly, then they must not have had anyone teach them proper technique. There could be a solution in that. If a player causes a concussion, perhaps we should fine his coach for not teaching him proper tackling technique. Start fining coaches, and then you’ll see some changes. Coaches need to be more demanding and not let players on the field if they cannot play the right way. This is why at early levels of football, such as Pop Warner and high school junior varsity, winning is not important. Learning is important. Winning in football doesn’t matter until high school varsity, when winning teams get attention and winning players get college scholarships. Considering that college football players are known to take very easy classes, it wouldn’t be at all difficult for some of these universities to offer a class in tackling, except most of the kids would fail.